A terrorist who plotted to blow up fuel tanks at JFK airport has been given 15 years in prison, the BBC reports. Abdel Nur, a citizen from Guyana, tried to meet an Al-Qaeda explosives expert in order to blow up JFK airport’s fuel depot, and the fuel lines that run below an adjoining neighborhood. He hoped to kill thousands in the attack. Russell Defreitas, Kareem Ibrahim , and Abdul Kadir were also arrested. Kadir is a former member of parliament from Guyana and is now serving a life sentence. Defreitas has been found guilty and will be sentenced in February. Ibrahim’s trial is scheduled for April. The plot was foiled when Kadir and Defreitas discussed their plans in front of an unnamed informant. This informant recorded their conversation and alerted authorities. This last detail is interesting. These radical Muslims would hardly have discussed such a plan in front of a non-Muslim. It stands to reason, then, that the informant is a Muslim. What these two nutcases didn’t understand is that most Muslims aren’t terrorists. This fact will almost certainly be lost amid the news of another “Muslim terrorist plot”. There are no hard figures for the number of Muslims in the United States since the U.S. Census doesn’t record religion. One study by Dr. Tom W. Smith of the University of Chicago estimates the Muslim population in the U.S. at around 1.9-2.8 million. If most Muslims were terrorists, as many people believe, the U.S. would be suffering attacks every day. Luckily this is not the case. Vigilance defeats terrorists, fear and stereotyping helps them win. With another holiday season behind us at last, it is time to start looking to the year ahead and firming up our travel plans. If you haven’t already made your preparations for 2011, and you’re looking for something a bit more adventurous this year, then perhaps we can suggest a few destinations that might meet your needs. Last year, when we shared our list of top adventure travel destinations it was populated with a few countries that are commonly recognized as offering outstanding experiences for the adventure traveler. Places such as Nepal, Tibet, and Peru, which are widely considered to be classics of this type of travel. For this year’s list, those places have been sent to the Adventure Travel Hall of Fame, making room for some up and coming destinations to get some much needed recognition. So, without further ado, here are my picks for the top adventure travel destinations for 2011. This may seem like an odd pick to begin the list with, but hear me out before dismissing it. The U.S. is one big, diverse place, with plenty to offer any traveler, let alone those looking for adventure. No matter what your outdoor pursuit or adrenaline inducing addiction, you’ll find an excellent place to pursue it here in the States. Enjoy mountain climbing? Then head to Colorado where you’ll find 53 peaks in excess of 14,000 feet in that state alone. Is mountain biking your thing? Then make the journey to Moab, Utah, home to some of the best trails in the world. Into kayaking? Great! What’s your flavor? Whitewater? Flat water? Sea kayaking? It doesn’t matter, you can do it all right here in the U.S., where there are plenty of forests, deserts, mountains, and rivers to roam. If you’re coming from abroad, you may be surprised, and a little overwhelmed, with all the options. And if you’re from the U.S., perhaps you’ll be reminded of the magic of domestic travel too. For travelers looking to go to extremes, it is tough to beat Argentina. The country offers visitors plenty to see and do while exploring a diverse number of unique landscapes. For instance, visitors can go to the Iguazu Falls region to take in the tropical rain forests and then travel south to Tierra del Fuego for a taste of the Antarctic. Backpackers and climbers will find plenty to love in the incomparable Patagonia district and paddlers will be thrilled with the whitewater options as well. The truly adventurous can test their mettle on the 22,841-foot tall Aconcaqua, the highest peak in the world outside of the Himalaya. Over the past decade, Eastern Europe has gone from a very well kept secret to a popular destination for those seeking unique cultures, lavish history, and fantastic art. But the region has plenty to offer the adventure traveler as well, with Croatia leading the pack as the best destination for adrenaline junkies. Travelers who enjoy being on the water will love sea kayaking and sailing on the Adriatic Sea, while those who prefer to be under it, will love to dive the various ship wrecks that are just off the coast. Moving further inland, paddlers will find crystal clear rivers to run, replete with plenty of whitewater while trekkers and backpackers will enjoy the mountain trails that offer breathtaking views of the surrounding countryside. Head to Ucka Mountain for a hike through dense forests that eventually give way to a spectacular view of Kvarner Bay. Another large and geographically diverse country, India can lure adventure travelers with a host of options. Want to spend some time on the beach or go diving and snorkeling? Then head to Goa for plenty of aquatic fun. Prefer a mountain trek? Then make your way to the remote northern region to gain access to the High Himalaya, along with its quaint mountain villages and Buddhist culture. For a different kind of hike head to the famed Valley of Flowers to experience more than 300 species of the colorful plants in one location. And for a truly unique adventure, explore the massive Thar Desert on the back of a camel. Often overlooked in favor of more well known South American destinations, Guyana is a great choice for adventure travelers looking to escape the crowds and get off the beaten path. Highlights include jungle canopy tours of the Iwokrama Rainforest Reserve and a visit to the 741-foot tall Kaieteur Falls, which is billed as the tallest sheer drop waterfall in the world. But no trip to Guyana is complete without a trek through the Rupununi region in the southern part of the country. This remote and isolated wetlands area is home to a dizzying array of wildlife including giant river otters, black caiman, anteaters, jaguars, tapirs, anacondas and more. Birdwatchers will find the place especially alluring with hundreds of unique species on display. Another destination that returns from our list in 2010 is Botswana, which offers its own take on the classic safari experience. Each year, seasonal rainfalls in Angola drain into the Okavango Delta, swelling it to three times its normal size. This conveniently occurs during the dry season, which means that the region draws vast numbers of animals in search of water. Visitors can take in this spectacular migration in a traditional safari vehicle of course, but the more adventurous will elect to go with a guide on foot or in a dugout canoe. Those two options allow you to get much closer to the wildlife, which include elephants, giraffes, hippos, lions, cheetahs, and so much more. And when you tire of watching animals, head to the Kalahari for a wonderful trek through the desert and a cultural experience with the famed Bushmen that inhabit that region. Straddling the border between Europe and Asia, Turkey has long held an allure for travelers of all types. It is yet another destination with a rich culture and history, and it shows in the variety of ancient ruins and unique structures that dot the landscapes. Trekkers who make their way to Turkey may be overwhelmed with all the options, with the Cappadocia region being the most popular thanks to its low degree of difficulty and unusual landscapes. Those looking for more of a challenge will want to check out the Taurus or Kackar Mountains, which offer much wilder terrain and higher altitudes to contend with as well. Mountaineers will find a variety of peaks to tackle, including the famed Mt. Ararat, the reputed final resting place of Noah’s Ark. Backpackers will love the 300+ mile long Lycian Way, which wanders along the beautiful Mediterranean coast. Sea kayaking, diving, and snorkeling in the waters of the Med will round out a very active visit. There you have it. Ten great destinations that will fill your travel itinerary with plenty of adventure in the year ahead. Enjoy! 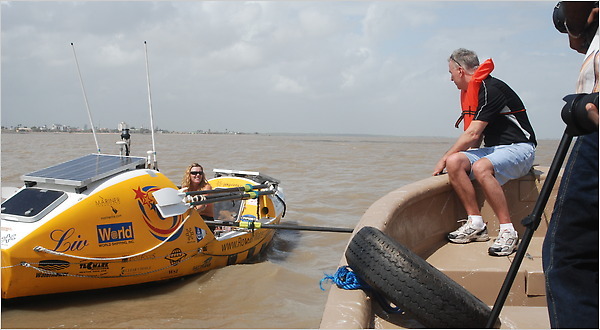 Way back in December we told you about Katie Spotz, the 22-year old American woman who was planning to row solo from Dakar, Senegal in western Africa to the east coast of South America. This past Sunday, Katie arrived in Georgetown, Guiana, completing her journey, while becoming the youngest person to ever row solo across an ocean in the process. The expedition covered more than 2817 miles of open ocean, requiring 70 days, 5 hours, and 22 minutes to complete. Reportedly, Katie could have shaved an additional eight days off of her time had she allowed a boat to tow her into shore as she neared her destination. While on approach to Guiana, strong winds and ocean currents conspired against her to make the final leg of the journey that much more challenging, but rather than take the tow, she elected to row an additional 400 miles northwest to Georgetown, where milder conditions allowed her to finish the trip under her own power. While Katie did hope to set the new record for the youngest to row an ocean, and become the first American to row solo from one continent to the next, she actually had even loftier goals in mind when she set out. The entire expedition was used to raise funds for the Blue Planet Run Foundation, an organization dedicated to funding clean drinking water projects around the globe. For her efforts, Spotz raised over $70,000 for the foundation, money that will now go to improving the lives of others around the globe. The 19-foot long, specially designed, rowboat that was used in the Atlantic crossing weathered 20-foot waves and occasional storms, but for the most part performed admirably. Fitted with solar cells to charge her gear and a desalination system to provide clean drinking water, the boat was Katie’s floating home for the past 2+ months. Aside from a breakdown in the original steering system, and a GPS device catching on fire, there were few technical setbacks to the journey. Congratulations to Katie on a job well done. The rest of us would have, you know, taken a plane, but your way of crossing the Atlantic works too. Katie Spotz has big plans for the new year. The 22-year old American is currently in Senegal where she is completing the final preparations for her attempt to row solo across the Atlantic Ocean. If everything goes according to plan, she’ll set out on her journey on the first day of 2010, and won’t step back onto dry land for three months. The young woman from Cleveland, Ohio will depart from Dakar, and cover approximately 2500 miles, with the hopes of arriving in South America, somewhere along the coast of Guiana, in approximately 70-100 days. While out on the ocean, she’ll face huge waves, massive storms, and endless days alone on the water. Katie will be making her journey on a specially designed 19-foot long rowboat. The boat has a small cabin that can offer some shelter from inclement weather, and specially designed hatches will help keep her gear and equipment dry. Two freshwater tanks are used as ballasts, while offering an emergency water supply, and the solar panels mounted along the deck will help keep Katie’s communications equipment charged, so that she can stay in touch while at sea. She’ll be making updates on her website, and sending back dispatches on her progress once she gets underway. While the ocean row will be a challenge unlike anything that Katie has done before, she isn’t doing it just for herself. She is using the opportunity to raise funds and awareness of the Blue Planet Run, an organization dedicated to financing projects designed to deliver clean drinking water in remote places across the planet. To follow along with Katie’s adventure stop by her website where you will find more information on her ocean row and read updates as she prepares to hit the water. Then return in the New Year to track her progress and watch her make an attempt on history. If she is successful, she’ll be the youngest person to ever row solo across an ocean, and the first American to row from Africa to South America. Here’s a tip for an out of the way adventure travel destination that isn’t on the radar for many travelers yet, and remains a remote escape for those looking to get away from the tourist crowds. There is a region in the Amazon Basin known as Roraima that sits where Venezuela, Brazil, and Guyana come together. The area is dominated by rainforest, as you might expect, but there is a small patch of savannah as well. But the most awe inspiring aspect of the landscape is the towering tepuis, or flat topped mountains, that rise up from the jungle and dominate the horizon. Roraima is incredibly remote. So much so that it was the inspiration for Sir Arthur Conan Doyle’s book The Lost World in which dinosaurs are found roaming the jungle. It is a tropical destination with a warm, wet climate, at least at the lower altitudes. When you scale the tepuis, the altitude changes the climate dramatically, bring gusting winds, cooler tempertures and thick clouds. The highest of those table-top mountains is Mount Roriama, which reaches 9,219 feet in height, and is generally the destination of choice for trekkers and backpackers to the region. The steep walls seem daunting when viewed from a distance, but there is a natural ramp carved into the side of the rock that makes for a non-technical, but physically demanding hike to the top. And when you reach the top, you’ll find an eerie lanscape carved by the constant winds and often wrapped in thick clouds. The experience is made all the more unique by the fact that the mountain is large and flat, and unlike most other mountains on Earth. In fact, the tepuis in the Roraima area are considered to be amongst the oldest geological structures on the planet, and seem oddly out of place in the jungle setting. Treks through Roraima can be organized in any of the three bordering countries, but it is most easy to get access in Venezuela. The hike, which includes a trip to the summit of Mount Roriama, generally takes about four to five days, and will lead the adventurous traveler through remote and relatively untouched areas.